Some years ago, when we lived in London, me and Him Outdoors did a couple of butchery classes at the Ginger Pig in Marylebone. I still can’t tie a butcher’s knot (I suspect them of getting a laugh out of teaching the most fiendishly difficult method) but I have been making porchetta ever since. Italian friends will correct me if I’m wrong but I think porchetta was originally a recipe for a whole sucking pig. As these are both expensive and not for the squeamish (poor little piglet) I used a boned and rolled pork loin. I departed from the authentic recipe quite a bit, but it was still very good. Strictly speaking you should still have the skin on the loin so you get lovely crispy crackling but I’d foolishly ordered mine skinless for making bacon before I hijacked it for this recipe. I didn’t butterfly it either, making it a bit lop-sided on carving. Recipes for the stuffing vary. I used the chives, parsley and sage I had sitting on the window sill. 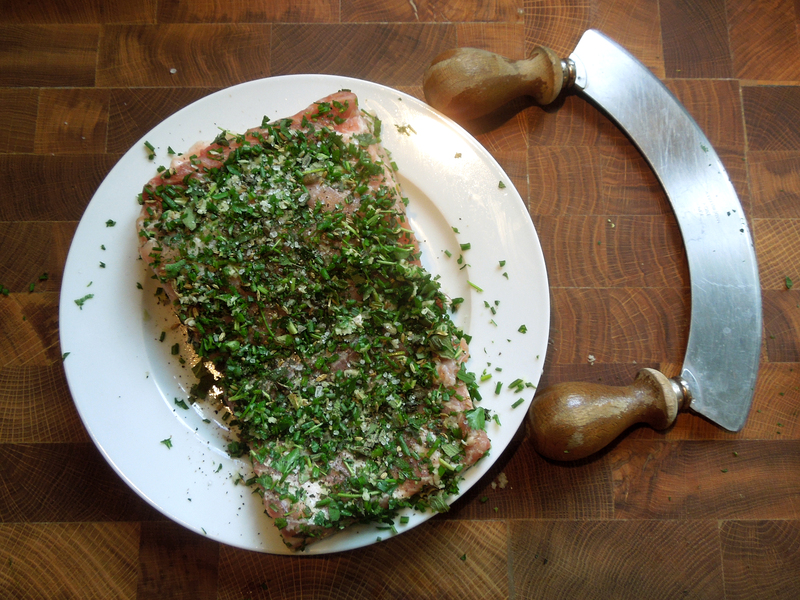 More traditionally you could try rosemary, oregano and lemon zest, and perhaps fresh fennel rather than fennel seeds. Leave this to get cold and slice it thinly and it’s a superb summery buffet dish. Or just cram it into a sandwich. It’s good either way. 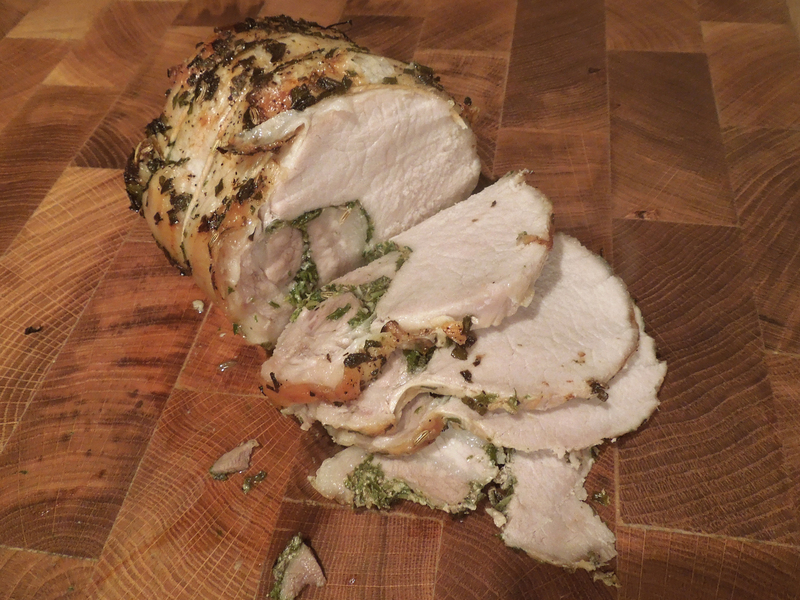 My pork loin weighed 850g/2lb, yours may be different. I’d suggest roasting it for 30 minutes per 450g/1lb plus 30 minutes, or until the internal temperature is 75-80C and the juices run clear. Score the pork skin (assuming yours has skin) then mix the stuffing ingredients together and spread over the inside of the pork loin. Season well, roll it up and tie it tightly with string, butcher’s knots optional. Rub it with a little olive oil and season again. 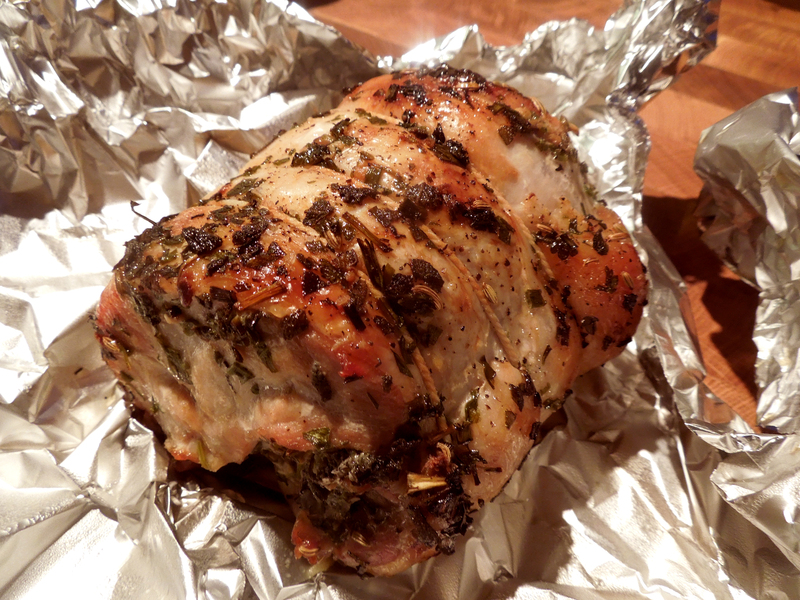 Place on a rack in a roasting tin and cook for around 30-40 minutes or until the skin is crisp and crackly. Then reduce the oven temperature to 180C/350F/Gas Mark 4 and cook for another hour (adjusting the timings according to the size of your joint). Cover it with foil if the top is getting overcooked. Rest, keeping it warm, for at least 20 minutes before carving. To make a quick sauce, skim any fat from the pan juices, stir in the miso and deglaze with a good slug of wine. 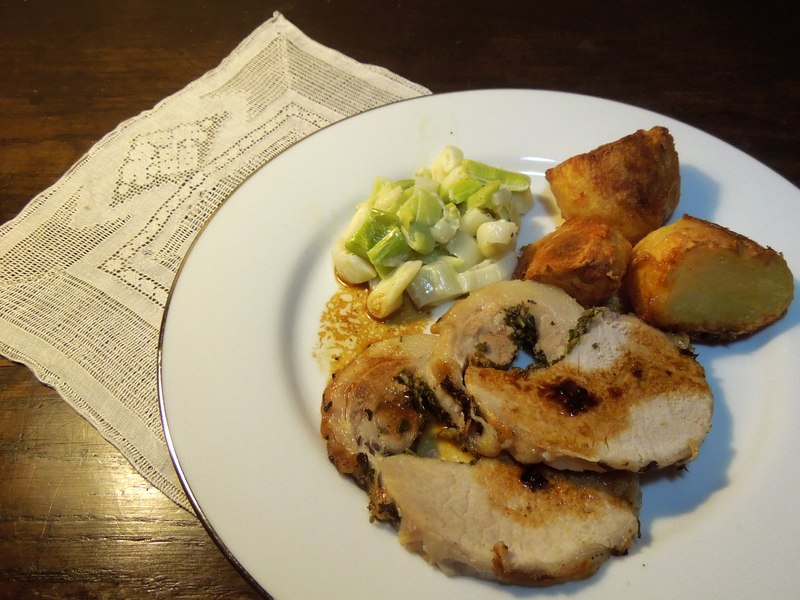 This entry was posted in Mains, Pork, ham and bacon and tagged herb-stuffed pork loin, porchetta, roast pork with herbs and fennel by Linda Duffin. Bookmark the permalink. Can’t have that. Get cooking!